Knoxville Mayor Madeline Rogero today announced the appointment of writer, musician and playwright R.B. 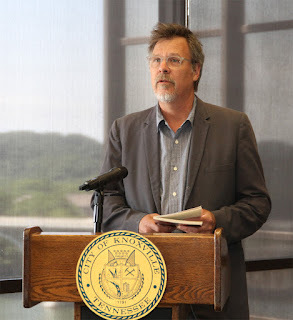 Morris as the first Poet Laureate of the City of Knoxville. Morris, whose poetry often reflects on East Tennessee culture and history, will serve up to two years in the newly created position. Mayor Rogero created the City’s Poet Laureate Program earlier this year, and nominations for the first appointee were considered by a committee of the Knoxville Arts & Culture Alliance. The selection committee forwarded its recommendation to the Mayor.